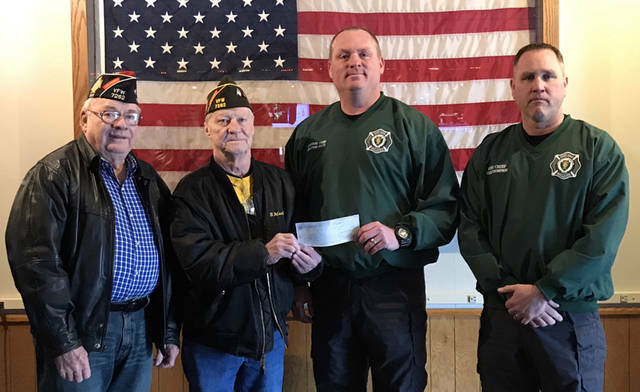 With a donation of more than $1,800 from the Greenville VFW Post 7262, the Darke County Fire Chiefs Association completed the second phase of a fundraising drive for a personnel accountability system. Plans are beginning for a third phase of the project, which will enhance safety and better track personnel for fire departments throughout Darke County. Pictured (l-r) are VFW Post 7262 Junior Vice Commander Don Dietrich, VFW Post 7262 Commander Ron Mills, Greenville Fire Department Assistant Chief Shannon Fritz and Greenville Fire Department Chief Russ Thompson.